The writing is on the wall for the future of journalism, with new research scoring the words more deeply into the plasterwork: 52% of bloggers surveyed by PRNewswire refer to themselves as journalists. The Web and e-publishing is only going to make this more relevant. I’ve written about this topic previously, and we discuss matters like it a lot here at FastCompany.com, so it’s fascinating to see so many hard figures in this survey underlining the points we make. PRNewswire surveyed over 1,500 “traditional and non-traditional” media folk along with over 1,600 PR professionals for the 2010 PRWeek/PRNewswire Media Survey. Among the various pieces of data revealed, the fact that 52% of “new media” bloggers refer to themselves as journalists is the biggest take-away. Though there’ll be a dab of semantic “drift” here, relating to a shifting definition of exactly what journalism is, the truth is that this also represents a shift in how “traditional bloggers” see their own work’s importance (if you consider “blogs” to be of lesser import than traditional journalistic publishing.) It’s almost double the percentage that the same survey in 2009 turned up, implying that the rate of change in this situation is phenomenal. Bloggers are even pushing their own medium: 91% of bloggers reported “always” or “sometimes” using blogs for story research, merely 35% of newspaper and 38% of print magazine journos say the same. While you may think the new cross-over breed of online reporters would be blog-friendly too, it’s not quite the case: only 68% of these guys said they use blogs. This, dear reader, is why you may read about a hot piece of new technology, or even a breaking piece of novel political or business-related news here on FastCompany.com and then stumble upon it days, weeks or even months later in the “main stream” news media, also labelled as “hot” and “new.” The pace of the publishing on the Internet drives this kind of timescale, and the “traditional media” haven’t yet learned they need to catch up. We’re not talking about journalistic best-practice here, or delving into the fact that journos on traditional publications tend to not have to worry about arting-up their pieces in real time, adding SEO-friendly tags and hyperlinks, or promoting them on an individual piece-by-piece basis using tools like Twitter. We’re merely pointing out the fact that the glacial pace of traditional media reporting is exposed by these statistics. And there’s one final thing to think about, in this oh-so-Appley week. 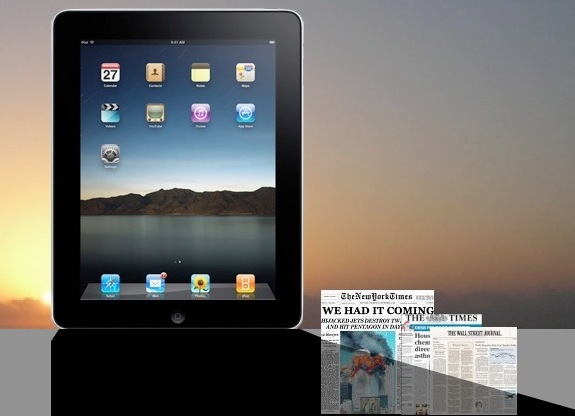 The iPad is likely to change all of news publishing (and, of course, so will its entourage of similar tablet devices.) That’s because whether you like it or not, the iPad is likely to change how the average consumer views the mobile Internet, and how they buy e-published newspapers and magazines. The difference between viewing, say, a newspaper’s dedicated iPad app and its Web page will be a subtle one, and will puzzle users. If the Web page is updated more frequently than the iPad-specific app, which one is more “valuable” news source? And for a user to click between, say, FastCompany.com, which some may consider a “blog” and an iPad app for a traditional news source, is really easy. Expect the 2011 PRNewswire survey to have even more skewed percentages to illustrate the rise of “blogging.” By which time we’ll be calling it journalism, as the distinction becomes irrelevant.